Tomorrow, they pull the plug. At long last, Minitel will finally be put out of its misery. This box materialized France's Videotex service Teletel, arguably the world's most successful predecessor to the web. Imagine, in the early 80s, elder citizen in rural areas connecting every day to consult their bank accounts, to purchase train tickets, or to chat in (sometimes naughty) fora. Imagine, in the early 80s, a thriving online ecosystem full of editors, developers, service providers, online advertising agencies... The loser was the enduser, of course, who was charged heavily for every minute online. But down the road, the pedagogy of the market was done (complete with the strident sounds of dial-up connections). Minitel turned out to be both a blessing and a curse for France. In the early 90s, the Minitel lobby managed to prevent the French government from investing in the internet because the business model was highly profitable for the operator (then the PTT monopoly, now France Telecom), as well as for the biggest service providers (fellow public owned companies like SNCF, the banks...). But internet laggard France would catch up once its ecosystem migrated to the web, rich of a long experience in online services. Heck. Even a short one did the trick for me: working for France's leader in online gaming back in 1993-94 bulletproofed me for the madness that followed. And because I experienced the last throes of the Minitel, I could tell why such media darlings as AOL or NTT DoCoMo's i-mode would eventually fail (the latter even benchmarked the Minitel's business model and proprietary system). We frogs loved to hate this French-Franc-guzzling old timer, with its screen and keyboard stuck in the 80s, stubbornly squatting next to our cool new DECT phones. Now we'll long for the quaint touch of Minitel's rectangular keys each time we visit the museum of ancient communications. 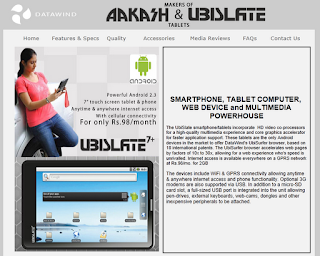 Last January, Aakash made a splash with its $41 Android tablets (1.4 M UbiSlates booked online within a fortnight). Still made by UK's Datawind but slightly improved, the device is now sold $61. WiFi enabled, it can be also connected to a broadband device via USB. Otherwise, Airtel provides an internet connection for $1.7 per month, but that's on GPRS. Not exactly LTE... but then again, the iPhone was launched on 2G when 3G was all the rage. Since January, Aakash made a quantum leap from Froyo to Gingerbread (Android 2.2 and 2.3, both vintage 2010 stuff). As announced during CES2012, Sony will launch its Google TV in Europe this summer. Sony NSZ-GS7 will cost $200, and combine a stylish set top box with a 1990sh remote control. The design tells a lot about Sony: a manufacturer who cares about how the most visible hardware looks, but pays little attention to the user experience. Software-wise, Google TV on Android remains behind Apple TV, but there's still some time until Xmas season. And the smart TV wars may be postponed because of The Great Depression. $550 for a Samsung Chromebook Series 5 550 3G? A relief for Windows. $650 for a Samsung Galaxy S3? Instead, you can get 4 Baidu smartphones in China: the Changhong H5018 goes for RMB 1000 (about $158 apiece), comes with a 100 GB cloud service, and runs on yet another Linux-based OS. After Alibaba's Aliyun, Baidu Cloud: the Google and the Amazon of China may be able to build decent user bases within months, and I wouldn't be surprised to see local players target emerging markets. Nevermind the hardware: cloud-wise, it may become more interesting.